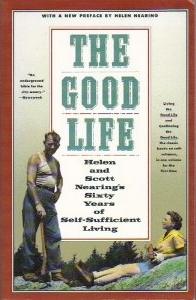 When reading about the Nearings, I thought about how different the definition of “good life” can be, based on individual preferences, needs and wants. Then the question became - how does the average person today go about creating their vision of the good life? Hence this post, which I’ve dubbed Part 1 as I’m pretty sure I’ll have more to say on this subject. How do you go about setting up the good life for yourself? Well first, you must define what “good life” means to you. What I think is good and what you think is good are likely very different. I know that what the Nearings saw as the good life is NOT how I would want to live. So what is your ideal life? Really think about this - and make some notes! To get you started, consider the following five questions. And remember, there are no wrong answers. What people, pets and/or possessions are close at hand in your ideal life? How do you spend your time while living the good life? What areas are non-negotiable and where are you flexible? Most people can imagine of more than one scenario that could be the good life so don’t think your answers to these questions are set in stone. Also, your ideal can (and usually does) change over time. But what is it right now? While it’s never too late to start creating your own good life, you won’t get there if you don’t even know what it is. So how about it? What would be the “good life” for you?